Living in a temperate climate region such as Canada certainly comes with its ups and downs. From October to the beginning of April we got the windows up, heated seats on, and maybe the sunroof open to feel that fresh snowy breeze travel down our lungs. For the remaining months, we’ll be wearing shorts when its 10 degrees and practically nothing when its 30. We will hit up the beach, have a cold drink on a patio next to the Harbourfront, or take a ferry across to the islands in Lake Ontario. 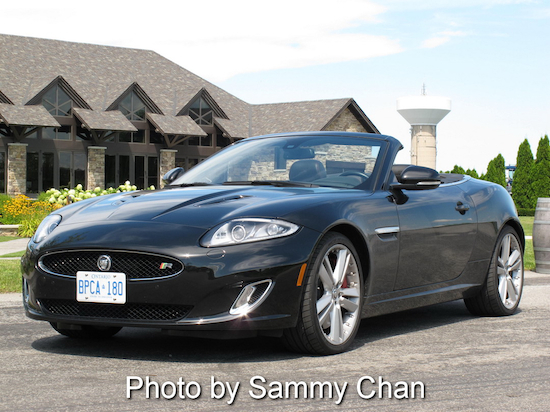 On a breezy summer day in July, I was given the opportunity to test drive the new 2013 Jaguar XKR Convertible and boy was it an experience. Let’s get a few things out of the way. Having a convertible makes you overly obsessive about checking the weather every morning. We pray and pray for those sunny skies - Sunlight? Top down with a smirk - Rain? Top up with a frown. And remember that Jurassic Park movie that came out in 1993? Piloting the rear-wheel drive XKR is like playing the role of the paleontologist… being chased by that T-rex. The bellowing uproar that comes out of those quad exhausts reverberates in your spine, making you believe that something prehistoric is giving chase from behind. So there is a dinosaur in the back. Not a problem for this kitty. It packs a 510 horsepower supercharged V8 and weighs just 1800kg thanks to a lightweight aluminum chassis. The power-band is strong throughout, with the signature V8 howl at 5000rpm. Itchy right foot temptations have never been this hard to resist. Jaguar has mounted its 6-speed automatic transmission onto the XKR, and it sure likes to be rebellious. Too many times has it denied my downshifts when I simply want engine braking. The gear changes are extremely delayed, giving choppier acceleration than the smoother and more refined 8-speed transmission found in the XJ and XF models. On the other hand, the steering is fluid and very responsive thanks to an active differential that gives the rear wheel drive chassis more control and stability. The active differential is standard to the XKR and XKR-S models. The XK has kept its handsome exterior looks since 2007 and not much has changed since then. But hey, if it works why fix it? Unique front fascias, aggressive hood intakes and quad exhaust pipes keep the R model looking feisty and attractive. This feline is punctuated by its big front grille with the signature growler icon and R performance badging to let you know that this is no docile Jaguar. Standard are low profile 19-inch tires, while ours was fitted with the optional 20-inch Kalimnos Alloy wheels that set you back $4000. Red brake calipers are also an option at $500 for that extra oomph of sporty goodness. The XKR sports a canvas roof that keeps our heads dry but our ears busy - Jaguar even gives you the option of choosing the canvas colour. 17 seconds is all it takes for the soft-top to open and vice-versa, a generous enough window to stop at a red light and close the top before the rain trickles on the supple leather interior. Hop into the driver seat and you’ll feel right at home - much hasn’t changed from the 2007 XKR model. A piano black veneer and red leather stitching envelops all the surfaces it can find, with a simple and minimalistic center console that serves as the heart of the Jaguar. The START/STOP button will pulse a hearty red, provoking you to press it and let the engine awaken from its slumber. The JaguarDrive Selector has made its way into the XK series and never ceases to entertain when it rises up and is ready to shift. The comfort of the soft leather seats make you want to fall asleep. Even the seat adjustment controls are styled elegantly and placed right next to the door handle. Speaking of door handles, one thing you might notice when sitting in the XKR is that there is no door-locking button. Rather, you push the door knob into the socket to lock the car. Unlike many other convertibles, the interior doesn’t feel cramped at all. Ample headspace and foot-room deliver a GT cruiser experience, unless you’re sitting in the rear “dog” seats. Then again, a Labrador might not even fit back there, let alone a human. So don’t expect anyone to sit anyone in the backseat comfortably unless you’re trying to punish them. Only when it rained did I have a chance to use the 525W Bowers and Wilkins speakers that come standard in the XKR model. Who needs the radio when you got the top-down and a symphony coming out of those four exhausts? The 14 carefully placed Bowers and Wilkins speakers don't give us that wow factor like BMW's Harmon Kardons do, but safe to say its sufficient enough to satisfy our aural temptations when mother nature is crying away. The steering wheel and instrument clusters.. well there is nothing new here, just that they are starting to show their age. The media interface is also losing its touch, with laggy controls and clustered menus that make it difficult to navigate through. Not something you want in a six-figure car, especially with competitors having more refined interfaces such as BMW’s iDrive. The ‘R’ badge has been around for 25 years, beginning with the XJR racing cars in 1983. It designates flagship models that best represent Jaguar in performance, design, and excitement. However, comparing the XKR to today’s top competitors such as the BMW M6 Convertible and Mercedes-Benz SL63 AMG is like comparing apples and oranges. Sure they all have retractable roofs, horsepower over 500, and exhausts that sound like Godzilla. But the Jaguar feels raw and primitive, while the BMW and Merc feel computer-driven, technologically reliant, and narrowly refined to the pinnacle of science. The Jaguar resembles something else, something harmonious and soulful. Rather, the XKR is a marriage of art and science that is enveloped with primordial noise. Forget about the technological feats and numbers, as it’s rather difficult to put an XKR driving experience into words and numbers. Wind blowing through your hair, an engine noise that wakes up your neighbours, and power - raw power. It all amalgamates into the signature Jaguar experience that sets the bar for cruising on those sunny days in Toronto.